This block of land and consented building plans for a seven-storey hotel, retail and residential complex in Central Christchurch have been placed on the market for sale under instruction from the property’s mortgagee. 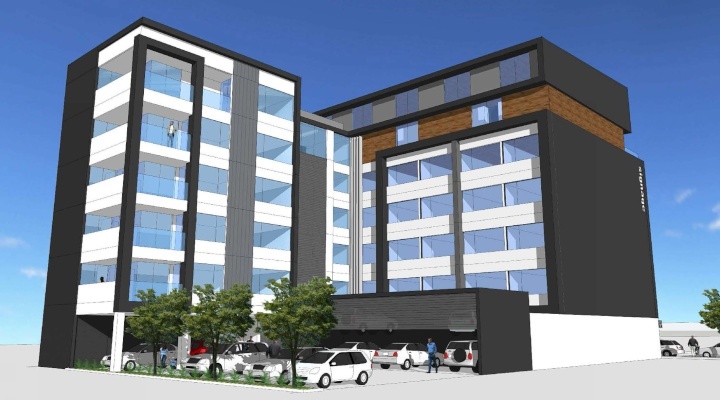 The land and consented building plans for a seven-storey hotel, retail and residential complex in Central Christchurch have been placed on the market for sale under instruction from the property’s mortgagee. The property at 818 Colombo Street consists of a flat 1,019 square metre site – with 25 metre frontage onto Colombo Street. Christchurch City Council granted building consent in February 2016 for the construction of a seven-level hotel, retail and apartment development on the site. •	Six two-storey apartments on the top two floors – totaling 838 square metres. The land and consented building plans are being jointly marketed for sale by tender by Bayleys Auckland and Bayleys Canterbury, with tenders closing at 4pm on June 14. Salespeople Mike Adams and Justin Haley said the Christchurch Council consent allowed for a 5.8 metre height extension to the central city mixed use zone plans for the area. “The council decided that based on the scale of the commercial accommodation and residential use proposal, it was more appropriate for the central city business zoning to be approved – which allowed for a 28 metre height limit and the provision for a seven-storey building. The residential units within the top two storeys of the tower are planned to be set back from the edge of the lower levels – allowing not only for the creation of balconies and decked areas, but also addressing any concerns of shadowing onto Colombo Street. Mr Adams said the site originally housed a 21.8 metre high five-storey commercial space built in 1989 but was significantly damaged in the 2011 earthquake and was demolished as a consequence. The consented plans show the new building is shaped in a horse-shoe design – featuring a controlled one-way vehicular laneway running down the middle of the building, with retail tenancies on one side and hotel reception areas and the apartment lift on the other side. Mr Haley said the property had been designed and configured to straddle both the business and leisure guest sectors – with the new Christchurch Convention Centre being the catalyst for attracting a growing number of activities, events, exhibitions and conferences to the city for both segments of the visitor market. “The plans show minimal foodservice operations for the site – literally offering café style fare. This strategy was based on the rationale that business travelers usually have business-related dinners when hosted by their local guests, while leisure travelers have a propensity to explore the city and amenities and attractions available within walking distance,” Mr Haley said. “Two of the city’s biggest hospitality precincts for example are less than a 10 minute walk away from what will be the front door of this hotel – the Oxford Terrace hub some two-and-a-half blocks to the south and the Victoria Street hub around the casino some 700 metres to the North-West. Mr Haley said that with construction of the city’s new convention centre now well underway and scheduled for completion in late 2019, supporting infrastructure was dovetailing behind. “In addition to the Colombo Street hotel and apartment site on the market for sale, there are also sites being offered for the development of a 200 bed hotel adjacent to the casino and a similarly sized property being marketed for development adjacent to the convention centre,” Mr Haley said. “With the Colombo Street property containing a serviced apartment offering of studio and one-bedroom units, it will be a different prospect to rooms within a branded four or five star hotel. Latest tourism statistics compiled by the Ministry of Business Innovation and Employment for the year ending March 2018 show strong performances across the matrices measuring Canterbury’s commercial accommodation sector. •	Accommodation capacity in Canterbury – excluding holiday parks – rose 5.9 percent, with two new hotels coming on line in Christchurch. The figures show hotels in Christchurch had an average occupancy rate of 84.83 percent in March, with guests staying an average of 1.62 days. Bayleys’ director of hotels and tourism, Nick Thompson, said that as Christchurch’s central business district continued to regenerate from the earthquakes, more and more domestic travel and visitor business would be lured back to the city. “Key to this is obviously the redevelopment of the city’s convention centre – founded on building up the meetings, incentives, conferences and exhibitions (MICE) sector which had shriveled away to an almost non-existent presence over the past seven years,” he said. “As that activity builds up again, so to will the demand for commercial accommodation. Before the quakes there were some 3900 three to five star branded hotel rooms in Christchurch. Post the quake that number plummeted to less than 1000. “Now it’s back up to an inventory of 2300 rooms, with an additional 800 planned to come on line in the next 18-months. That’s still at an inventory lower than before the ‘quakes so there is still plenty of capacity in the market.